The holiday party season is in full swing from now through January. Architectural fans can impress their guests with building-shaped deserts. 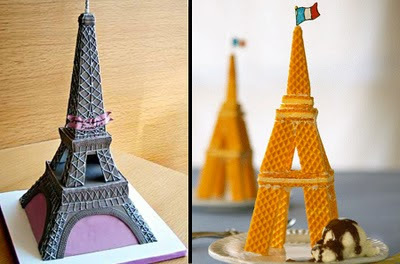 Here is a recipe to build an Eiffel Tower using sugar wafers as building blocks and frosting as cement. An Eiffel-Towering cake is also a popular design. The mother of all sweet confections must be the 12-foot-tall chocolate Eiffel tower created for Paris’ St. Pancras railway station, from which the Eurostar train departs. This gingerbread and hazelnut tower is for those with a very big sweet tooth. Previously, I’ve written about other building-shaped cakes, chocolate and even JELLO. Bon appetit !